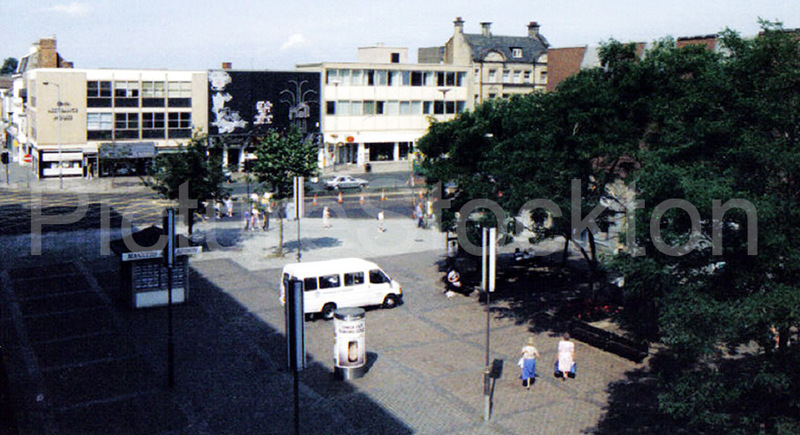 This photograph of John Walker Square was taken in June 1992 from the multi-storey car park. Photograph and details courtesy of Martin Spires. This entry was posted in Stockton High Street by Picture Stockton Team. Bookmark the permalink. Good old Stockton High Street when it still was thriving and had a heart and soul. It’s a little ironic that we are looking across this lost open space towards The Mall and the PO which are to be demolished and become a new outdoor space. This looks like it is from Swallow Hotel and I can’t ever remember cars and trees where Iceland currently is! Can anyone advise please? John Walker Square was a pedestrian area, so the mini bus must have been there for a specific reason. The square had several kiosks, trees, raised planted areas and benches. In some ways it’s a shame this outside space was lost, and today we don’t really need the extra shops that were built there. Not forgetting the railway carriage that was there in 1975 for the 150th anniversary of the Stockton and Darlington Railway. There is a photo of it on this website.